50mm black webbing fitted with galvanised hook and a sewn loop the other end. 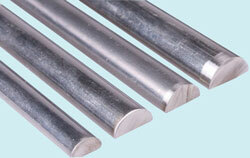 Zinc plated finish for resistance to rust and corrosion. Internally lubricated drum, bushing and pinion gear shaft bearings for long life and easy operation. Shafts and gears of high tensile alloy steel. Formed reinforcements in frame give added strength. Smooth turning rollgrip handle. THIS PRODUCT MUST NOT BE USED FOR LIFTING. 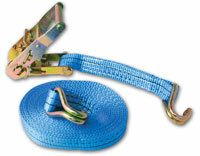 Zinc plated 5m ratchet lashing and hooks, with 25mm webbing. Made from stainless steel. 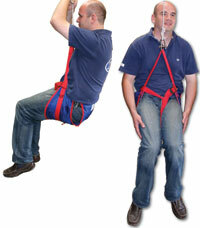 Suitable for 35mm webbing, breaking load 1800Kg. Universal winch handle will fit all winches with the international star top. 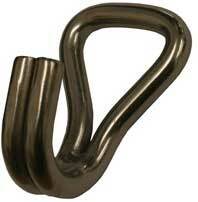 Made from aluminium alloy. Handle locks in place. Made from soft and flexible white PVC, to hold any standard size winch handle, complete with Stainless Steel self tapping screws. Fits onto mast or in the cockpit for easy stowage of winch handle. Complete kit for a webbing Jackstay up to 12m long, with unique adjustable buckle. Slide Master Winch grease. Very high Teflon content - ideal for marine threads. 50g Tube. Made from zinc-plated steel, strong construction with wire gate. 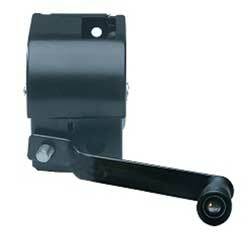 Goliath stainless steel auto brake winches have a security self breaking system for lifting applications. The Load can be held without an action on the handle. Made from 316 stainless steel. Not suitable for lifting people. Goliath compact winches use a worm drive system so they have no need for a break and ailent operation. Table Bases available in 600 and 700mm lengths (Silver Anodized Aluminium). Lock in floating winch handle made from plastic.